I love a bit of leather. Especially in skirt form. You can imagine my delight at those two things together. 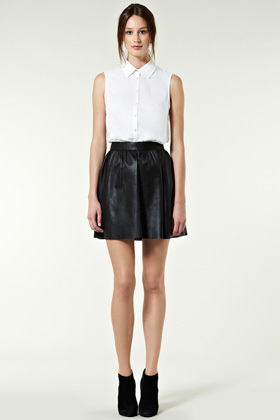 At £80 it’s a little pricey for a skirt but it is leather so that makes it more reasonable. I’m virtually pairing it with every chunky knit in my wardrobe! "What I’m Wearing: French Connection Printed Trousers"
"Model of the Moment: Cara Delevingne"
Topshop have a virtually identical leather one for £38. Only difference is a non-stitched hem, so can be uneven in places.